The Doncaster Girls Home and School of Industry was originally established in 1799 at French Gate, Friars Bridge, Doncaster. In 1862, the home was refounded and subsequently came the management of Miss Beckett Denison of The Hall, Doncaster, who performed the role for more than thirty years. The establishment provided a home for 'female servants, orphans or children who have lost one parent'. The home was certified to receive girls placed there by the Boards of Guardians who administered the poor relief and workhouse system. A charge was made of four shillings a week for girls placed there by Guardians, while those supported by friends paid a slightly higher rate of £12 a year. The home could accommodate up to 30 girls aged from 10 to 15. They were trained in laundry work, needlework and knitting. The location of the home is shown on the 1902 map below. Doncaster Girls Home and School of Industry site, Doncaster, c.1902. In 1901, the running of the home was taken over by the Waifs and Strays Society, becoming known as the Beckett Denison Home for Girls. It then housed around 20 girls, aged from 7 to 14. Miss Beckett Denison maintained an active interest interest in the school although withdrew from its formal administration. 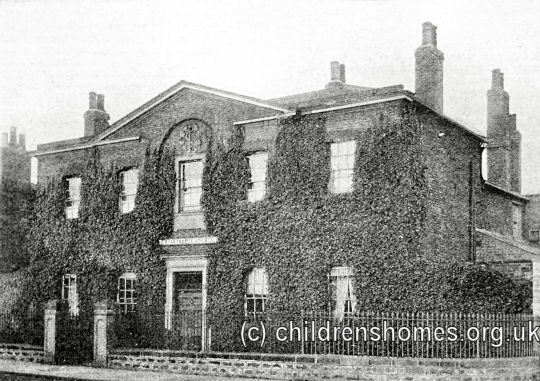 The home, which was located near the railway in a run-down part of Doncaster, was closed in 1905 owning to increasing concern about the girls' health. The residents moved to new premises know in the Balby area of Doncaster which became known as the St Christopher Home. The French fate premises no longer exist.